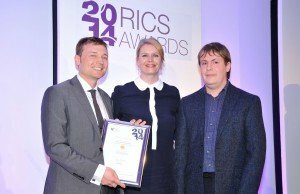 GLM was delighted to receive the ‘Highly Commended’ award in the Tourism & Leisure category for our work on Natural Retreats John O’Groats at the 2014 RICS Awards ceremony. These prestigious awards recognise the achievements of land, property and construction projects across eight categories – Design through Innovation, Building Conservation, Regeneration, Residential Property, Commercial Property, Infrastructure, Tourism & Leisure and Community Benefit. Working on behalf of a joint venture partnership between Natural Retreats and Heritage Great Britain , GLM acted as Project Manager, Architect and Construction Manager in the re-engineering of the Masterplan to revive John O’Groats. From left to right: Aythan Lewes (GLM Associate Director and Project Manager), Sarah Spiers (Director of RICS Scotland) and Neil McAllister (Project Architect) accepting the ‘Highly Commended’ award for Natural Retreats John O’Groats.